A heated procedure surface with downdraft anesthetic gas evacuation. Minimize personnel exposure to trace anesthetic gases by connecting the DSx to your in-house suction or an auxiliary vacuum pump to evacuate gases from the nosecone area of the patient. When used correctly, the DSx will become an essential part of your anesthetic evacuation protocol. 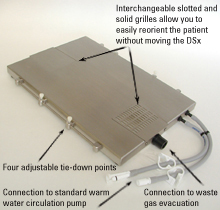 Patient recovery is safer and faster because the DSx connects to any warm water-circulating pump, providing maintenance of vital body heat without danger of burns. Built-in anchor points allow you to easily stabilize the patient. This sealed unit, constructed of durable stainless steel, stands up to hand cleaning and disinfectants or, can be run through your cage washer.